All competitors must attend one briefing at sign on. Juniors and concession card holders may be asked to present identification at briefing/sign on. Competitors must obey all boating laws including, but not limited to, all Go Slow areas, speed restricted areas and not enter or fish in restricted areas including, but not limited, to Port Of Brisbane. All fish must be Angled/line caught with bait or lure - no spear fishing, no jagging, no netting or any other method that isn't with hook and line. All net types are banned except fish friendly landing nets when landing a hooked fish. Competitors are encouraged to use low carbon footprint fishing methods including electric motors paddle boards and sail. Competition starts after first briefing at 4pm Friday 3rd of May at George Clayton Park. Fish friendly handling practices should be used at all times. This includes fish friendly landing nets, comfort lifting fish with wet hands and using circle hooks. Gaffs must not be used at any time. Prizes will be awarded for 1st 2nd and 3rd for these categories. Photo entry catch and release only. Important - Bream, Snapper, Whiting, Thread Fin Salmon are measured to fork not total length. 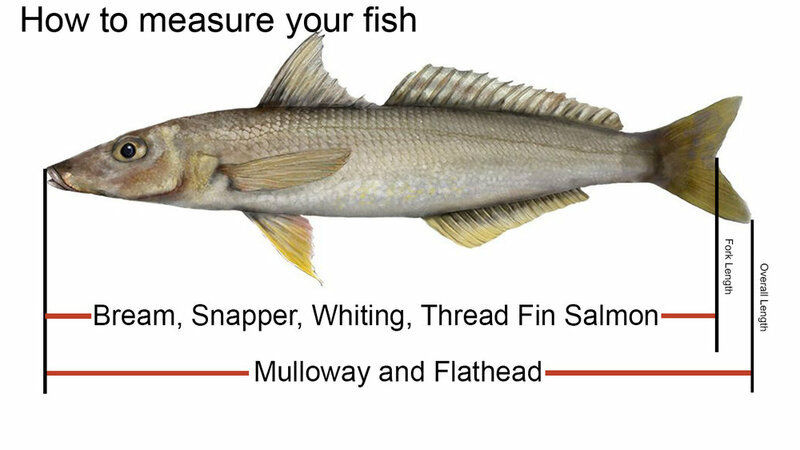 Mulloway and Flathead are total length. Photo must be of a live fish, include the unique item in photo and be on a measuring mat that is wet to avoid damaging the fish. Unique item and measuring mat will be handed to competitors at sign on. Photo must be taken on a phone and viewed by a marshal on the same phone that took the photo. Photos must be the original photo taken on that phone. Photos must not be re saved, sent to another phone, changed, resized, filtered, scaled or doctored in any way. Note. We use a temporary honesty system for weigh in. Competitors are to tell a marshal what size and type their largest fish is. The top 5 competitors names go up on board, Top Gear style, with the sizes of the fish. The size of the fish for the first 3 places are hidden. Once weigh in is closed, photos are verified and prizes awarded. If the size of a fish is smaller than what the enterant has indicated, the entrant will be no longer eligible for lucky door prize. Champion Angler specific rules - All anglers qualify for this category. There will be 2 prizes only. One for Champion Angler Adult, One for Champion Angler Junior. All photos must be taken on the same/one phone. Only one fish per species submitted per angler. Only legal sized fish are eligible for photo entry weigh in.